Wonderful. bury in the backward, maybe indoor planter. could become plant food with certain additions. I also recommend reading the book or at least the website full of summaries for Project Drawback, an expert made list on the top 100 solutions to reverse global warming in order. (https://www.drawdown.org) Thank you for your time. what happens in the rain ? more and more options....also have seen corn and soybean made bags...…. They don't dissolve INSTANTLY Cara, if you check the site it shows you that. 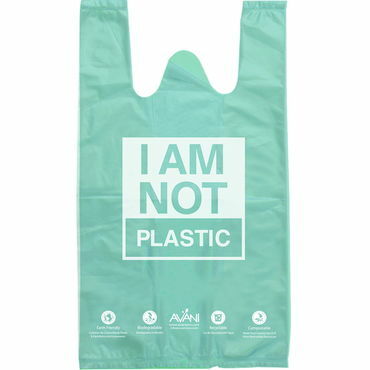 This type of eco-bag should be made mandatory - no reason not to except the petroleum industry would not like it. Thanks Animae. Thank you Animae. A great option for those who do not bring their own bags. Good idea, but I always feel a bit uncomfortable with packaging that could be used as food. Is there an excess of of cassava in Indonesia? Very nice! In the meantime, I carry cloth & canvas bags in my car. Some places give me a nickel discount for every bag I use. That may not seem like much, but those nickels add up. i carry cloth bags too but just standing in checkout queues, i know many do not!!! Good idea! I use bags that I take to the supermarket each week to put my fruit and veggies in, weigh and sticker them. A supermarket in the Netherlands sells them. Sometimes I just weigh the items and put them straight into the bag with the sticker on them. It would also be possible, I think, for people to take sheets of newspaper and wrap that around things like onions and potatoes. Also, my supermarket has now stopped plastic wrapping on some items - individual cauliflowers for example.